President George W Bush and Tony Blair have promised to work together to win peace in the Middle East. Speaking during a joint White House press conference, Mr Bush said he aimed to see an independent Palestinian state during his second four-year term. The two leaders also vowed to continue to strive for stability in Iraq and Afghanistan. What did you think of the comments made by Tony Blair and George W Bush? How should they deal with challenges such the Middle East and the environment? Send us your reaction. It's appalling. Blair is the only leader in the world left whose opinion has the capability to stop Bush in his tracks and he's standing by and doing nothing. Never mind the Middle East, what about the equally important issues of global warming, international trade, UN reform or discussing how to deal with North Korea? Good, healthy doses of cynicism are neither good nor healthy. Our history and our identity is inextricably joined with the UK, and I for one look forward to building relationships, not undermining them. It spoke volumes when the President failed to answer a direct question regarding his willingness to get Israel to stop expanding settlements on Palestinian land. The PM also chose not to say anything. These two can talk all they want about a just settlement and peace in the Middle East. However, until they are willing to lead in pressuring Israel to cease and desist from its suppression of the Palestinian people and the stealing of their land, their talk is just that - empty words signifying nothing. The question is if Tony Blair is still foolish enough to trust any 'promises' from Bush. Certainly the majority of his own people are not buying any of this. We are all inextricably linked to the United States. There is no nation that is not in one way or another directly affected by the US, especially large English speaking democracies like yours. Whether you love or absolutely hate Bush, your country's viability is tied to international trade, it is an island after all, and anyone who suggests that Blair should not meet with another world leader, no matter how unpopular, is doing themselves and their country a great disservice. It's all very nice to see Blair have a special relationship with Bush. But when will he have a special relationship with the people in his own country and do what he is paid to do? That is reflect and act upon public opinion. Our country needs a prime minister, we already have a foreign affairs minister. There are many Americans who do value various relationships with the UK. None, however, is more tenuous than the one created by Blair's unwavering support of Bush. The UK will find out exactly how special this relationship is if and only if Blair actually stands up to Bush. Perhaps that more than world peace, global warming, or trade was the subject of this meeting. Special relationship or not, it is certainly a relationship that must take place. I can't understand why so many people pour scorn upon this meeting. We are both engaged in a very dangerous operation in Iraq and such meetings should take place whether you agree with the conflict or not. You have two leaders who's job it is to have a co-operative relationship, regardless of who goes to war and who doesn't, who signs up to Kyoto and who doesn't. Tony Blair - "visionary leader"? He ought to go down to Specsavers and then he could give the second free pair to Bush!!!!! Those supporting the 'relationship' should wake up and smell the coffee. It has cost thousands of innocent lives with precious little benefit to the British people. The supposed 'need' for closeness to the US is a smoke-and-mirrors trick to maintain an unjust status quo and it's fed by Blair's appalling vanity. Special relationship? My girlfriend is American. She cannot come here to live and I cannot go there without going through months and months of red tape and trauma. How about opening up immigration between the UK and the USA? It would benefit both sides, and a lot more people besides my girlfriend and I. Considering how the "special relationship" between our two great nations is often said to be farcical and worthless, a heck of a lot of people, particularly in other EU countries seem jealous of it. I personally hope for a little more moderation from President Bush in his final term now that he doesn't have to play up to hard right supporters in order to boost his re-election chances. Blair might be a hopeless PM, but his diplomatic and inter-personal skills are first class. It is true that the US has a close personal relationship with England. Our citizens love you. We are grateful to you for your stand against terror. We are grateful to you for your brotherhood. You have stood beside us in the face of our enemies, and we will always stand beside you in the face of your enemies. The idea that we're in a "special relationship" with the US is an arrogant and outmoded fantasy on the part of the British. We only have any credibility in the US because Blair followed Bush like a lapdog into Iraq. If we'd been more cautious we'd have been dismissed as just another decadent Old European country. The US only cares about the welfare of the US, and it is about time we in the UK looked after our own interests. Although it is regrettable, I can believe the American public going along with Bush, but it is much harder for me to understand England and its citizens doing so. I thought they were more sceptical than us. Also, I do not now understand nor have I since the beginning of the war, what Blair's political motive is in towing the line of Bush's policies. Can it simply be a matter of wanting to stay on good terms with the world's most powerful nation, or is it something more specific? These two men are the best hope for a democratic and civilised world. They need to keep on with much of the same. We can never give in to global terrorism and must make a stand for freedom. This alliance is critical to the future of our world. It is bigger than both men and there has never been a better time to show bold leadership in enabling a just settlement for the Palestinians and Israelis. Both parties to the conflict must be required to stop holding the world to ransom by their intransigence. Fortune favours the brave. Bush and Blair can do this; I pray they do! A meeting of two jobbing politicians. What the world needs is statesmen not those who deal in sound-bites like these two. I am fed up with this term 'special relationship'. What is special about it? We'd like the US to sign the Kyoto agreement, be less protectionist, do more to broker a deal in the Middle East (lack of) peace process, we wanted them to go through the UN rather than act alone in Iraq. Have we got any of these things? Are we likely to? No. Not that special then really is it. A meeting of minds? Certainly a meeting devoid of conscience. What special relationship between UK and US. The US "tolerates" the UK because we are useful to him. If the relationship is so special, why is it so difficult to get a residency visa for the US if you are British? Believe me, I have first hand experience of this. Bush should spend more time worrying how he is going to pay back the billions of dollars he has borrowed from Social Security to fund this war. It is very difficult to buy health insurance for a family of 4 in the US for under $800 per month. Horrific figures when the average Joe takes home about $1500 per month. His history on conservation issues has been a dismal failure. Come on guys, concentrate on the problems in your own countries - leave the rest of the world alone to sort themselves out. Britain and the USA are more like close relations than just allies. Contrary to many (British) comments, I know many friends and relatives in the USA who recognise the 'special relationship' too. Relatives may irritate one another, but the strong bonds remain. No other country has this sort of relationship with the USA. The "special relationship" is so rooted in our shared history of law, philosophy culture and common endeavours that, though often enhanced and focused by the symmetry between individual leaders, it is essentially based on common interests and ideals between the peoples of the US and UK. Perhaps Tony Blair could instil in Bush a kinder, more inclusive attitude towards allies and foes alike. Why does the president always have to give the impression that he is shooting from the hip whatever he does? With the passing away of Yasser Arafat there is a golden opportunity to turn the page. For starters, Blair could tutor Bush on the need to be more even-handed on Arab-Israel issues. Does Bush want to bequeath a pollution-ridden world to posterity when he completes his term? He should listen to Blair's pleas for the Kyoto Agreement to be revisited and that America signs up to it. I find it amazing all the naysayers. It's a tough job they have to do. Blair's already said no to Bush several times, but everyone focuses on one thing. Iraq. What about Sudan? Our strength together is special, and it's an opportunity to do things. Those that whinge simply do so because they don't understand, are uninformed or are fed by the liberal loony media. Mr Blair should get Bush to honestly lay out a plan for Iraq. Whatever plan he has now, is not working. Also, the Palestinian issue needs to be discussed. The Palestinian people need, and deserve their own state. I'm not surprised Americans have a false sense of superiority over the rest of the world if each world leader runs to George Bush for help. Tony Blair should be travelling to the US to break up with George. I hope Mr Blair and Mr Bush will talk as British Prime Minister and US President respectively and not as buddies. I wish they realized how much the world depends on their talks and decisions. Our world has never been free from evils and never will be. In my opinion, a successful politician is one who can avoid war and achieve what is necessary. The value of politicians will go down if they keep choosing war against diplomacy. What has Britain gained from this so-called special relationship? Americans do probably see the British as their close allies and friends for historical reasons like language, heritage etc. But when it comes to national interests (such as trade, environment and international laws and convention), this hyped-up relationship hardly means anything. Have you not watched the Sopranos - friends are friends but business is business. It's appalling that Blair left the country on Remembrance Day. He should be laying the poppies at the fresh graves he helped to create. He should be honouring Britain's honourable and brave. Well, well, well! There he goes again. Tony ("Reporting for duty") Blair off to meet the Commander-in-Chief. And presumably bringing his jeans and sweater for the photos as he strolls across the lawn advertising his dentist's excellent work. Maybe next time he should take the initiative and invite the 44th President of the world's greatest democracy to Chequers for a quite, reflective, no photos weekend? Why does Tony boy keep running to Washington? Why can't George Bush dash over to London at the slightest opportunity? 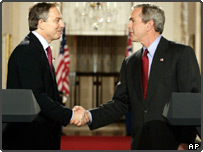 I like George Bush, but Tony Blair is a bit over-the-top with this "shoulder to shoulder" business. I think Kyoto should be a priority for discussion. If the world is destroyed by adverse climate changes, there'd be nothing else left to talk about. Kyoto please! Prime Minister Blair should bring a message of increased co-operation. England went with America to Iraq. Now it's for both nations to withdraw within the next 6 to 12 months. If Bush disagrees then Blair should pull out British troops. I am a Republican and I agree with the war in Iraq. But enough is enough and our troops need to come home. The main priority for Blair should undoubtedly be the perpetual suffering of the innocents in the Middle East under Bush. Branding all who resist US policies as 'terrorists' is dangerously simplistic. 'The bad guys' which has about as a much resonance in this context, who are going to be beaten by 'the good guys' and at any cost is a policy doomed to failure. This visit is timed to ensure that Blair does not have to confront the Nation at the Remembrance Service on Sunday. Perhaps Bush and Blair should keep out of the Palestinian conflict and turn their attentions back home rather than perpetuating a bad situation in the Middle East. To Ibrahim: Part of the problem is that the average person I know is angry at Tony Blair's behaviour on our behalf. Unfortunately, until we have the general election, the many of us who do disagree with him have no opportunity to say so meaningfully. With the support of Mr. Blair, President Bush has foisted an unnecessary & disastrous war on Iraq, our two countries and the world. Now, Yasser Arafat's death provides these two men an unprecedented opportunity to help broker a vital peace in the Middle East. Both leaders should focus their efforts on setting a joint strategy for bringing Palestine and Israel together for substantive, productive negotiations as soon as possible, before the window of opportunity closes. What is so special to be "special relationship"? Nothing special at all. It is a matter who will gain and who will lose in this "special relationship". There is no such thing as getting equal advantage of everything. Think hard! Meetings between heads of State are always important. No doubt Blair has some influence and his job is to make sure that influence advances British interests. What is ridiculous is drawing some sort of kudos from being the first to meet the re-elected President. That is more fitting in the school playground. The "special relationship" is non-existent, and I'm fed up with mention of it to justify our the UK's puppet status to the US master. Whilst civilians are being slaughtered in Iraq (note that this is very rarely mentioned, only the fate of "insurgents"), we must face the fact that our government is complicit in an illegal invasion of another country. The fact that it is a Labour government just rubs salt in the wound. I will never support this government. I urge people to join with the unions in opposing the government's neo-conservative policies, as this is the only true path of opposition left. The re-election of George Bush has demonstrated that the US and Europe do not share the same values. The UK will have a harder time being the bridge between Europe and the US in the future but should still try and fulfil this role. The term "special relationship" is only ever used by the British media and government. In the US you never see this term used, which indicates to me that while the USA do feel they have a great ally in Britain, it is not quite as important to them as we in Britain make it out to be. The special relationship is truly unique in diplomatic history. Great Britain should not underestimate its very key place as America's closest ally and the advantage it brings her in all affairs! I wish our Prime Minister spent as much time trying to build relations with European leaders. That's where Britain's destiny lies and it's where we can stand among equals. There's nothing equal in the so-called special relationship with America. Everyone here seems to think it is Blair going to the US in a position of bargaining power. Bush has just been elected for the next four years with the largest majority ever - he can basically do now whatever he wants even more than he did before. If any strong influence is to be asserted during the meeting, it is hardly likely to come from the direction of our prime minister. With British servicemen on active duty in Iraq, and taking casualties, surely Mr Blair's place on Remembrance Day should have been the UK. Would the Tories have been any different if they were in power? It is interesting to see that whenever the US or UK face violent resistance to their aggressive expansionism, for instance in Iraq or in Palestine, they always call for a pacifistic and Ghandi-like leadership to be promoted in those regions. I don't see any of these peaceful traits in these leaders. Actions always speak louder than words. Iraq is burning loudly, Palestinians are dying daily, innocent civilians are being killed by the US and their sponsored regimes around the globe. Where is the outrage from the average American or Brit now? In the past, these talks have produced some surprising and interesting results. Blair has actually managed to gain concessions out of Bush, and I believe this meeting will be no different. The big question will be, will these concessions be the headline grabbers that Blair needs to get him back into office? Blair's main role will be, however, curbing the excesses of Bush's policies. Surely the procedures for "sorting out the world" are already in existence. The Kyoto Protocol would "sort out" the environment. The UN resolutions against illegal occupation of Palestinian land would "sort out" the Middle East, etc... but America appears to ignore international judgements as it sees fit. If the democratic decisions of the entire planet make no difference to the actions of is America, what difference can Tony Blair make? Blair wasn't able to influence Bush in the last four years, and neither will he be able to do so in the next term of office. All Blair is doing is alienating our allies in Europe, alienating his own party, and alienating the country at large. If Blair wants another term himself, he ought to start listening to his party and his people. I think his timing is absolutely disgusting. He is flying out on 11th of the 11th. That should mean something to him, and he should be in London, paying his respects to the elderly war heroes but hey, his little mate Bush is FAR more important. Blair brings no message. He is there to take orders. The couple who live next door to me are British and split their time among the two continents. They are in their 70's and my wife and I are in our late 20's we don't really agree on any of our choices not even our leaders, but the one thing that we understand is that when Great Britain and the United States stand together there is not a single power in the world that can stand up to us. History has shown us that. There's only one world leader whose opinion has the power to sway the US president. We love Tony Blair and it seems we like our President. Prime ministers and presidents will come and go but our friendships should never change. I, for one, am very pleased when the Prime Minister of the UK stops by for a visit. Reminds me of our common heritage and ideals. Now on to what they need to discuss. As Mr Blair has made quite clear in recent weeks, the "Road Map for Peace" in the Middle East needs to be pushed forward. As it seems that Mr Arafat will, perhaps, not be returning to power, this task may become a bit easier than has been the case in the past. One major obstacle remains in my view: Ariel Sharon. Perhaps if Sharon could be voted out, newer, younger leaders will emerge who really want peace. In any event it is something the UK and US can, and should, work together on. The world looks to both nations for leadership, perhaps we will be able to provide some in this arena. The Bush and Blair meeting is just a stage show. Are we so naive to think that they will discuss anything worthy of discussing at this "Meeting"? They talk to each other each day by phone. Quit the acting guys. We Americans are grateful that the UK still has courageous leaders with principles. In 10 years these men will be appreciated as much as Thatcher and Reagan were! Bush and Blair must give priority to the chaotic situation in Iraq. The whole world is waiting for these great leaders to solve the crisis as soon as possible. The priority for both PM Blair and President Bush must be how to extricate their nations and their forces from Iraq with dignity and honour. The path they are on today, with the latest example being the disastrous decision to take up the terrorist challenge in Falluja, has all but ensured a nation and a region in turmoil for at least another generation. That aside, Mr Blair must impress upon Mr Bush the urgent need to reach an accommodation with Europe. Four more years of Europe-bashing by the US will result in Nato's disintegration and a decision by the European Union to develop a superpower's military capability to match its economic and political superpower status. Europe is going to be a superpower, Bush and Blair will determine the extent of its development by their actions. I don't know what makes the English People think that the Black Watch deployment has anything to do with Bush's Re-election. If the USA is an imperialistic, aggressive greedy country, we had the most experienced nation in the world as teachers. Maybe Bush needed advice from the British to refine our greedy fascism in a more polite manner such as the Brits have. Great job on Palestine/Israel Britain. Hopefully Blair will stay in the US and then we can vote for a real leader, not a show puppet. The two most powerful men in the world in one place together, hopefully they will come up with something that will be useful to society. No matter who is in power, people will whinge and moan. I say to you all - 'Grow up and support your current government as they have a very hard job to do!' Bush and Blair are both good, decent men with good morals (that most of you don't seem to like!) who have their countries' best interests at heart, and together they could actually move mountains... Cynicism is so easy when you aren't in the other person's shoe! I wish them all the best. My prayers are with these two great leaders as they meet. I fervently hope that Mr Blair will find the moral courage to politely impress upon Mr Bush that his job as PM is to promote and defend the rights and interests of the UK, not those of the USA. The prospect of the UK one day becoming nothing more than a state in a federal Europe is bad enough; the more likely prospect of becoming the 51st state of the USA is positively frightening. Mr Blair could, and should, use the opportunity to publicly distance himself from Mr Bush's brand of neo-imperialism. Of course he'll do no such thing, preferring instead to agree warmly with everything Mr Bush has to say, then returning home having achieved absolutely nothing other than reinforcing his standing amongst the American far-right who put, and kept, Mr Bush in the White House. I'd like him to explain to GWB that the "unity" Bush wants is a two-way process - it involves America compromising as well as everyone else. Sadly, I doubt that George (and, seemingly, a majority of the US electorate) are capable of understanding this simple concept, and also Blair does not appear to have the moral courage to push the point. To Bush, unity means doing exactly what he wants, and to Tony Blair much the same seems to apply. The special relationship between the UK and US must be upheld, for the sake of the UK. Without it we are lost in the, rapidly declining into decadence, mess of Europe. Blair and Bush are two of the worst leaders either country has ever had, with little regard for anything but their own self importance, but let's be grateful they haven't severed those ties. Personally I feel that these two men are good for each-other and our Country! These are realists and not in some fantasy world. I am really happy Bush is re-elected and I hope he carries on being brave and hopefully he will be a great figure for Tony Blair to follow. The only way to deal with Bush is to publicly stand up to him. He's proved, many times, that he can't handle unscripted challenges, but Blair continues to protect him. Personally, I think that Blair's credibility has all but disappeared, and I don't expect anything of substance from this meeting. Will Tony be back on time to attend the Remembrance Day Service on Saturday night at the Royal Albert Hall and on Sunday at the Cenotaph? I've never not voted in my life - I firmly believe it's my duty, but looks like come election day I ain't going to bother. Love the symmetry: a Scottish terrier for Laura, an English poodle for George! The message should be a simple one. Let's get this world sorted out, get everyone talking and round a table to resolve issues and bring peace. Mr Blair has demonstrated outstanding courage, character and leadership during these difficult times. His relationship to President Bush is that of a steadfast ally - just as it would if John Kerry had been elected. Europe has never been any kind of political role model, and UK fortunes, like it or not, are tied to the US. Tony's first priority will be to ensure that he secures the deals that will pay for his £3.5 million mortgage, because his salary can't pay for it. He needs American popularity much more than he needs British popularity. Only American popularity will earn him the huge sums of money he now needs. Americans should understand that most people here see no 'special relationship' between Britain and the US. This relationship only exists between Bush and Blair. It is a one-way relationship in which Blair simply agrees with Bush on everything and challenges him on nothing. This meeting will just result in the usual photo-opportunity with a dewy-eyed Mr Blair looking desperately sincere next to his boss. He can say what he likes - Bush won't list, so what does it matter? It is false to say that the UK troops in Iraq had anything to do with Bush's re-election, because they were given little to no media attention in the US. The only agenda Blair is trying to advance is his own. Bush deceived his own people, fair and square - the UK just happened to be a casualty of Bush's war on political accountability. Tony Blair has no power to affect anything Bush does. I shall be resigning my membership of the Labour Party now that I know the world is condemned to another four years of war and environmental destruction. We are led by a man to whom the title governor Blair would be more apt than Prime Minister. This country has no sovereignty over its foreign policy and is in the pocket of Bush and big business. The main priorities of the meeting should focus on finding amicable solutions between Israel and Palestine and ensure the safety of people in the Middle East and to put a hold on human right abuses. People say being the 51st state is a bad thing. If we were the 51st state, we'd have about 100 electoral college votes, most of which would have leant towards Kerry. I think Tony Blair is a man of incredible fortitude. I admire him, and if he were American, I'd have no problem with him in the White House. As for the talks, at least wait until they are over to declare failure. I and many other Americans pay attention to Blair, and I am sure Bush will too. After all, he is in incredible debt to Blair and perhaps will spend some of his earned "political capital" with what Blair has to say. Mr Blair should wait until he has a live microphone and then tell all the world that he will no longer be used to spread a veneer of respectability on Bush's disastrous international policy. Despite remarks about "old Europe" from those in the administration who should know better. I believe Mr Blair is being used. President Bush will no doubt greet Mr Blair warmly and call him friend and thank him for his support on the War on Terror. Mr Blair will use the photo opportunity to try to show that he is a world leader. He will talk of the Middle East and the need for peace. George Bush will ignore him and life will go on as it has for the last 4 years, Tony doing what George wants him to. I believe Blair, besides the photo op, is only intent on firming up his lecture tour schedule as well as continuing his contacts with big business so that he may ensure his wealthy retirement after he has ruined the UK and eventually been thrown out of office. I hope that they talk about the policy going forward in Iraq, assuming the assault on Falluja is successful. There should also be a policy on how to handle Palestine post-Arafat and serious discussion of the Kyoto protocol, although the US won't act on this unless an environmentally driven Democrat enters office in four years. The only reason why we are valuable to the US is to be their gateway into Europe. Bush wants Blair as his voice in Europe to win support. If Mr Blair can't see this then he is more naive than I thought. Meanwhile we alienate Europe and move towards being the 51st State. Blair laid his job, his government and therefore the future of the UK on the line to try and maintain a relationship between the US and Europe. If nothing comes of it now we have to change our emphasis to supporting the building of a powerful Europe to balance the US. Isn't it about time that George visited London for these cosy chats rather than the other way around (save his state visit of course)? This continued situation of Tony flying to Washington merely reinforces the notion that he is Bush's lapdog. I would like to offer my encouragement to Mr Blair. I'm no fan of New Labour, or the war, but we need to rebuild bridges. Whatever comes of the talks, and I'm not a great fan of either leader, perhaps we should just be grateful that George W Bush is prepared to have a cordial relationship with Britain at all. This is the most powerful nation in the world after all, and at least we've got them 'on side'. Why should Mr Blair have any influence on Bush when half the American population doesn't? I think, from what I've read in the newspapers and so forth, that Blair seems to have a very good plan for 'part two' of the transatlantic special relationship. In general, it seems to be a good plan with good intentions for both Britain and the wider world. It's also one that finally reveals to the British public the fact that Blair is actually thinking through his professional relationship with George Bush, rather than, as some critics have argued, just following the President blindly like some sort of poodle. Why is Blair going to the USA rather than Bush coming to the UK? Could it be that Blair is worried that the British people will take to the streets once more to express their opposition to this ill-conceived alliance of military aggressors? Blair's junket, no doubt at the expense of British taxpayers, can only be made worthwhile by him telling Bush that he may no longer rely upon unconditional support from the UK. American policy is governed by the "constitution", arbitrary rich and powerful businessmen and, to a small extent, American public opinion. Mr Bush has been given a clear mandate to continue his right-wing policies. If Mr Blair believes he has any influence on the American administration, he is deluding himself and those poor members of the UK public who may believe him. We need to stop the sycophancy! I think he should congratulate him and then straight away tell him that besides getting on with the task at hand, i.e. Iraq and the war on terror, that he now has a tremendous opportunity to unite his country and the western world by engaging all in dialogue and reaching a common ground. The time for "my way or the highway" is over. If he wants to build toward a safe, peaceful, and prosperous world he must be open to listening and realise that his agenda may not be the best for everyone. They will agree on a press release saying how important Mr Blair is, how much Mr Bush thinks Mr Blair is wonderful, and how hard they are going to try to achieve a breakthrough in the Middle East. Meaning, nothing will happen. It would be nice to think that Blair is in a position to nudge Bush in a more progressive direction. But that would mean getting past Cheney and a host of powerful special interest groups that so dominate American politics. Frankly, it's just not going to happen. I suspect that a far more likely outcome of this (and other) meetings is that Blair will be stuck trying to convince the rest of us that Bush means well. Sadly, not a whole lot Blair can do about it. It doesn't matter what is said, Bush won't listen to Blair. Why should he, he's got Middle America! The meeting is great news for this country though as any association with Bush can only be bad publicity for Blair. Carry on cuddling up Tony! Keep reminding us of one of the many reasons you should go at the next election. Blair will get nothing from going to Washington apart from a very warm thanks for sending the Black Watch towards Baghdad and thereby helping Bush to win the election. Surely even Blair can't be naive enough to expect Bush to listen to anything he has to say, whether it be on Iraq, Palestine, Kyoto... whatever. "May I have my medal now?" What makes you believe that Blair will bring a message to Bush and not the other way around? After all Blair has already stated, commending on the US election result, "America has spoken the world should listen". Well in my opinion, leaders like Blair and Bush should listen to what the world has to say for a change. Most correspondents here seem to have already forgotten that their green, left agenda was decisively rejected by the American electorate last week. Live with it - Mr Bush will show real leadership and not follow anyone else's agenda. Good for him. Blair has much to learn from him. If Blair can convince Bush to make positive changes toward climate change and America's international relations I'll eat my hat! Tony Blair shouldn't even go to America and waste his time. They should do it over a TXT message conversation. Blair needs to get Bush to do something about reducing the amount of pollution coming out of America. As the future president of the G8 summit Blair should push Bush on the Kyoto mandate. The threat of global warming is far more serious than terrorism and Bush's focus on the latter is doing serious damage to the environment as well as world peace. He should push on the Middle East - but somehow I don't think Bush will listen. Wake up boy! There's a whole other world outside or America! The message that Tony 'the puppet' Blair should take to George Bush is....now that our moving of troops has helped in your re-election....can we move them back before more of our brave lads die fighting your battle!